Patricia Juarez, Director of the UPOLI Library, Tomas Tellez, Vice Rector, Dave Sevick, Executive Director of Computer Reach, and Leonel Morales, President of the Student Organization of UPOLI pose with a few of the laptops from Computer Reach. This fall, in partnership with GlobalLinks and Richard White, a former Honorary Consul Nicaragua to US, Computer Reach delivered 73 laptop computers to the Polytechnic University of Nicaragua (UPOLI). 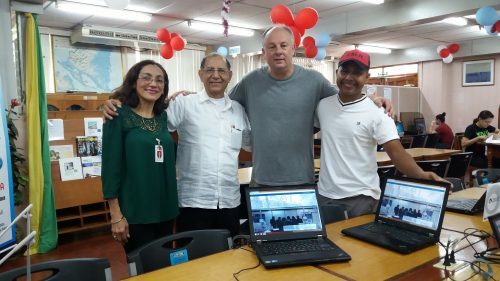 On November 13th, 2016, Dave Sevick, Executive Director, traveled to Managua to observe the set up several of the computers in UPOLI’s library lab. UPOLI is a Christian-Baptist university, and its mission is to provide higher education that contributes to education, scientific, economic, social and cultural development of Nicaragua. Its main campus is in Managua, and it has three regional branches. The University serves over 10,000 students, 80% of whom are low-income. The Computer Reach equipment is located at the main campus library, and will be used by students in all fields of study. We plan to continue this partnership with UPOLI in 2017, furnishing all regional campuses with computers in time to celebrate UPOLI’s 50th year.